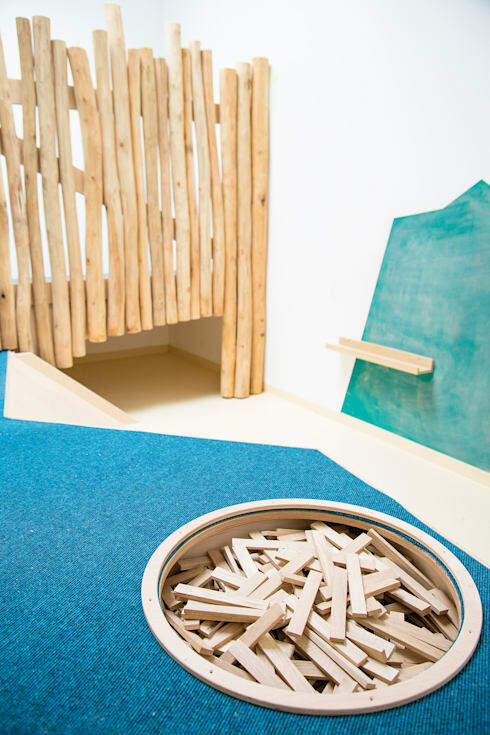 Creating a space with children in mind can be one of the most challenging, but most potentially inventive, experiences in working in design. In shaping any interior, whatever the specific brief, the goal is always to create something that looks great but is also wholly functional. That’s still the aim when working with areas meant for children, of course; but there is an added difficulty that stems from the fact that children, and very young ones in particular, use space in totally different ways to the ones we’re probably more used to thinking about. Not only that, most have a set of aesthetic ideals and tastes that is completely unlike those possessed by adults. Small children are usually drawn to bright colours, and it often doesn’t particularly matter to them how well those colours work with each other or with their surroundings. 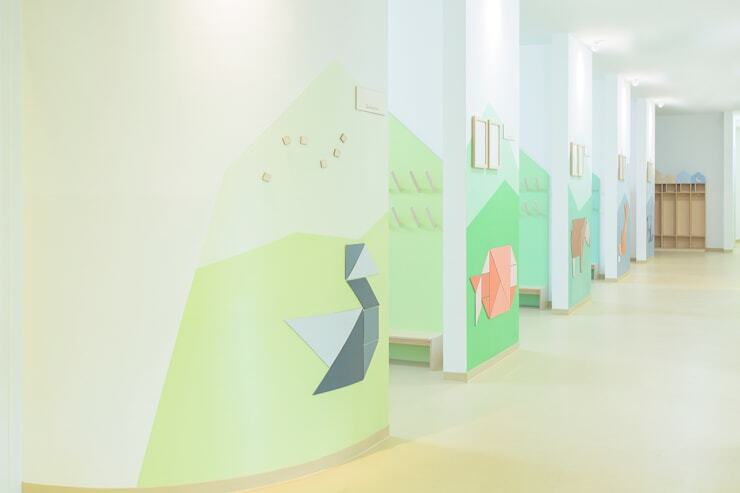 That’s why any space that succeeds in balancing all these conflicting factors – in being visually appealing to both adults and children, while showing careful consideration of the way children interact with the world around them – can be considered a true triumph of design. 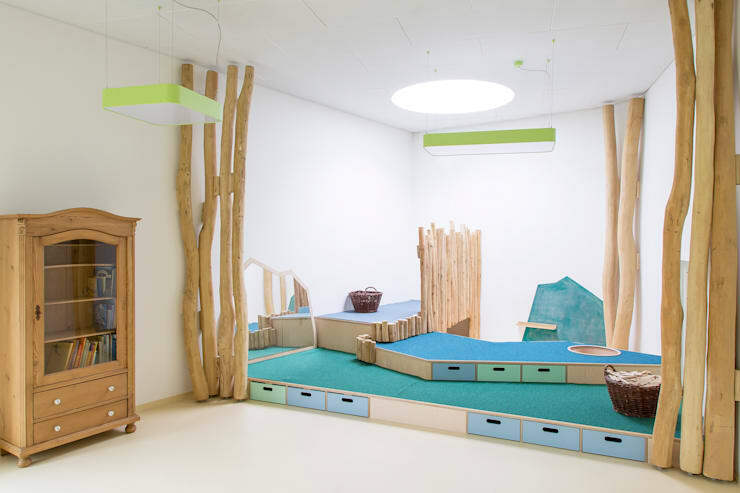 This German kindergarten, designed by Mjuka, is an example of just such a triumph. This photo, though it shows only one little corner of the kindergarten, manages to capture many of the key features of the interior: the pastel colours, the geometric patterns and the pale wood and wicker accents. The kindergarten is also filled with spaces just the perfect size to be exclusively for infants. The wigwam is a particularly fun place that we bet is always extremely popular with the students here. Portholes like the one seen in the wall behind are also scattered around the building, providing “secret” routes for getting between one room and the next. 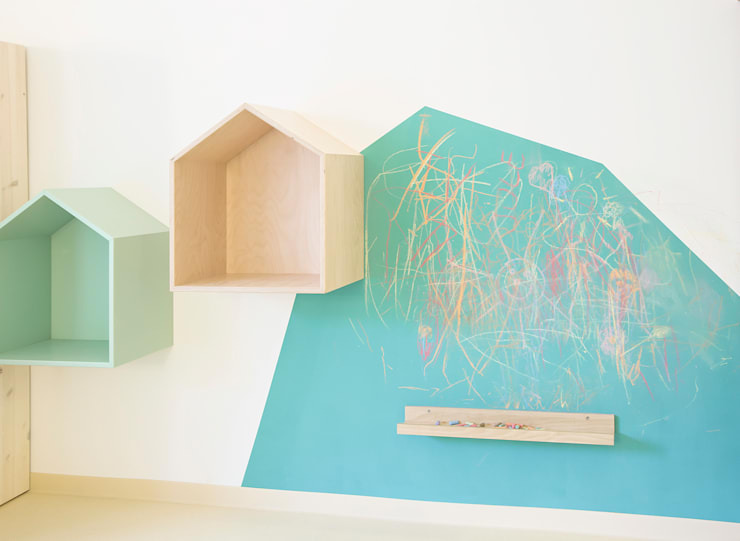 Elsewhere, this forest-like play area neatly incorporates practical drawers for stashing toys away once the fun is over at the end of the day. Once again, the designers have taken care to indulge that great love shared by many children: the love of hidden spaces. And that mountain-like outline on the wall to the right? That’s a chalkboard, for those times when the students don’t feel like hiding at all but rather like putting their talents on display. 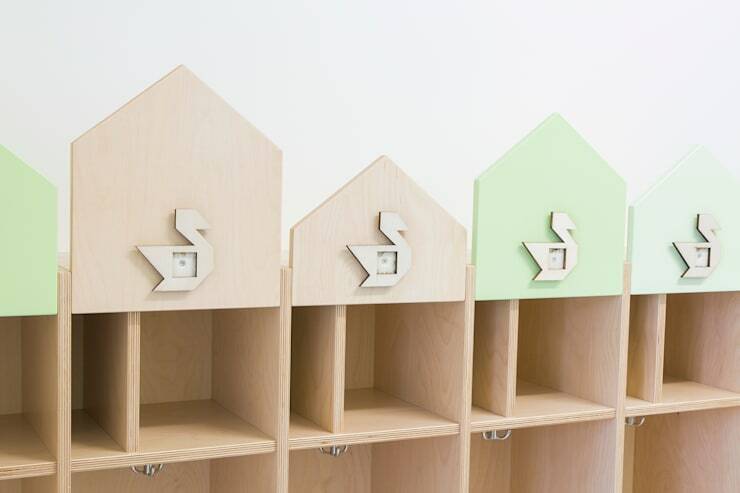 These cloak rooms are each themes after a different animal, so children have a fluffy, finned or feathered friend to associate themselves with. The duck motif reappears inside the room itself. 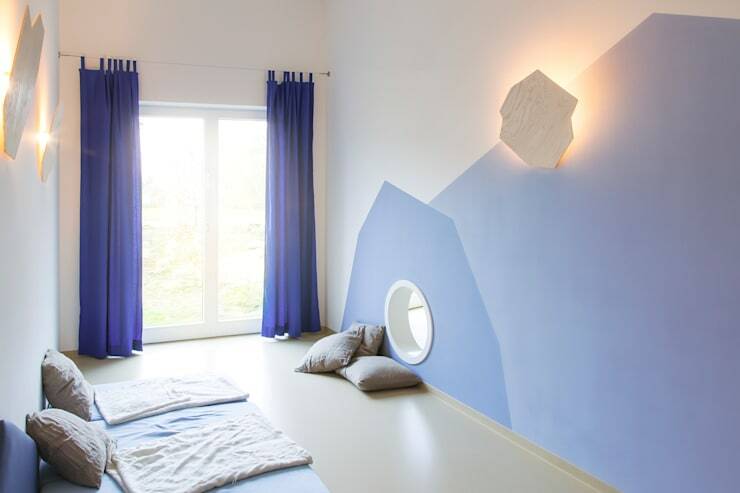 These mountain-shaped chalkboard panels, like the one we saw earlier, appear throughout the interior. Toddlers often seem to suffer from a near-irrepressible urge to draw all over the walls, so this is a good way of letting them indulge that desire without ruining a room. The pale colour palette and large windows ensure that this room seems bright and welcoming – the perfect environment for engaging in lively, stimulating play and burning off a little excess energy. 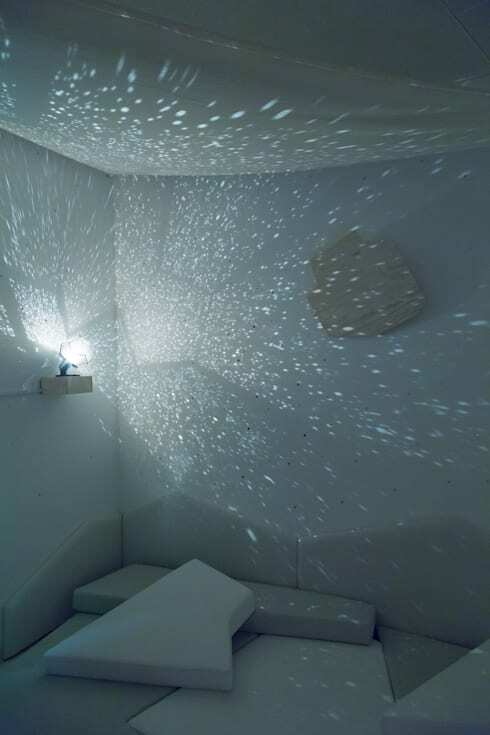 And once that energy’s been burnt, the adorable night-themed room next door offers a cosy spot to curl up and catch some Zs, watched over by softly illuminated clouds. Naptime never seemed so appealing! Here glacial tones contribute to a very different vibe to the one in, for example, the area with the wigwam. It’s like entering into a totally different zone, which offers totally different play opportunities.